The Cassida 5520 professional money counter offers contemporary styling and uses the latest technological advancements available in the industry. 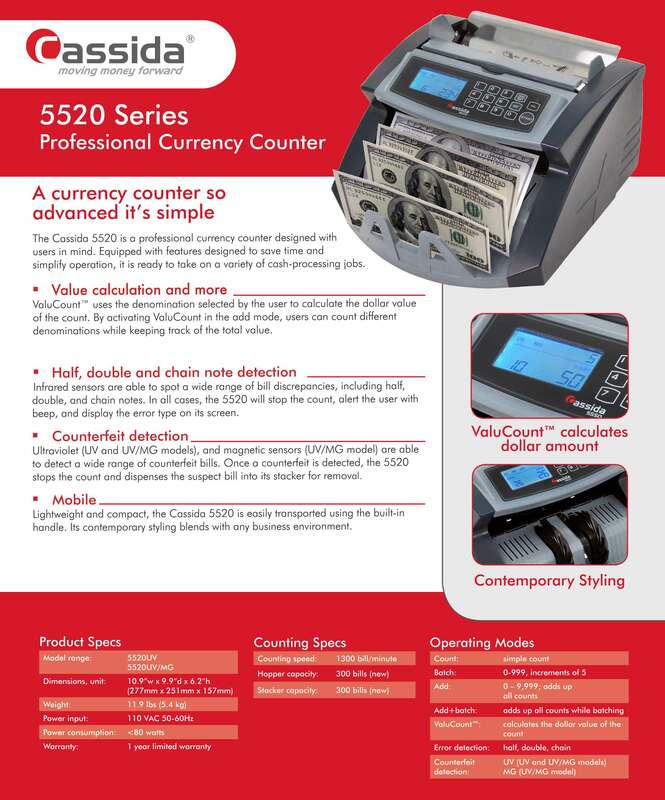 A professional grade currency counter, designed with users in mind, the Cassida 5520 is equipped with features designed to save time and simplify operation and is ready to take on a variety of cash processing jobs, including built in counterfeit detection. 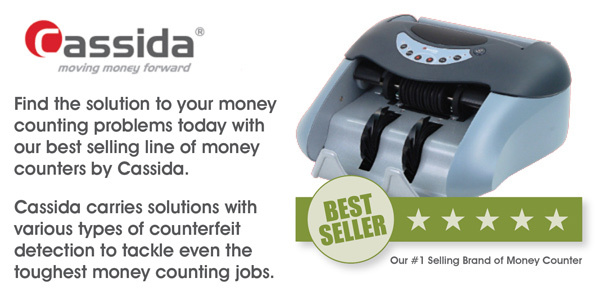 At only a fraction more than a cheaper built machine, the Cassida 5520 offers professional level money counting and counterfeit detection capabilities, as well as a the exclusive ValuCount� feature, which allows the machine to have some of the properties of a discriminating money counter, without the higher price point. Cassida bill counters are equipped with an auto-start feature, which significantly reduces time in cash processing operations. Machines start batching, counting, or adding automatically the moment bills are placed in the hopper. Lightweight and compact, at just under 12 pounds, the Cassida 5520 money counting machine is easily transported using the built-in handle. Its contemporary styling blends well with any business environment, and intuitive and simple controls, as well as automatic features, make the Cassida 5520 bill counter easy to operate. An increasing trend in counterfeit money has forced many businesses to search for a way to combat fraud. This model is available in two versions � one with ultraviolet (UV) detection, or an upgraded model with both UV and magnetic (MG) sensors, which are able to detect a wide range of counterfeit bills. Once a counterfeit is detected, the 5520 stops the count and dispenses the suspect bill into its stacker for removal. Remember, however, that NO counterfeit detector on the market is guaranteed to catch bills 100% of the time, however it does great reduce the issues associated with accepting bills that may potentially be counterfeit. ValuCount� uses the denomination selected by the user to calculate the dollar value of the count. By activating ValueCount in the add mode, users can count different denominations, while keeping track of the total value. Infrared sensors are able to spot a wide range of bill discrepancies, including half, double, and chain notes. In all cases, the 5520 will stop the count, alert the user with a beep, and display the error type on its screen.